I have been home from CCDA for over a week and haven’t given myself much time to write or process the conference. Sometimes those two are one and the same for me; the writing and the processing that is. I think that’s what writers do– Because the very act of writing can help make sense of what’s swimming around inside. CCDA brings people together; people from across the political spectrum, with different colors of skin and and a range denomination affiliations. Some come with dreadlocks, fresh out of college, others with strollers and kids on tow, and a few with their greying hair, and years of wisdom and experience. We sang in English, then Spanish and Mandarin. We heard speakers, preachers and professors from every walk of life. A Palestinian Christian. A Native American from the Sioux Reservation. A Duke professor. A recovering addict. An 88-year-old son of a sharecropper from Mississippi. …and I could keep going. My sister did one workshop titled, 9/11, Al Qaeda and your Muslim Neighbor. I probably learned more in that one hour than in any history class I ever took in school. She talked bout the Muslim faith, how our news-media represents both sides so poorly and what does it really look like if we are called to be neighbors and friends. My Twitter-friend-turned-real-friend, Sarah and her husband did a fascinating workshop discussing the Multicultural family; looking at everything from cross-cultural marriage, raising bi-lingual kids and living biracially. I was all ears. CCDA is definitely geared for people working in urban centers doing some kind of community development work, but much of what is discussed applies to churches, families, teachers and really anyone with a desire to be more intentionally involved in serving your community. As a first timer to this kind of conference, what stands out to me is not the richness in our differences and unique perspectives; no, it was the shared commitment to keep asking what it means to do this together. How do we commit to keep loving Jesus and our neighbor? How do we keep caring for the widow, the foreigner, the immigrant? How are resources distributed and who has access to them? How do we create a world where women are just as valued and heard as men? What does justice look like in public eduction, tax laws, churches and neighborhoods in your community. These are questions that were asked. And we keep asking together. And just like we keep seeking Jesus and Justice and asking these important questions. CCDA recognizes that we also must keep asking for forgiveness. And keep acknowledge what we have done wrong in the name of the Church and capitalism and consumerism. Reconciliation is not possible, until there is an acknowledgement of the wrong, the pain, and the grief. 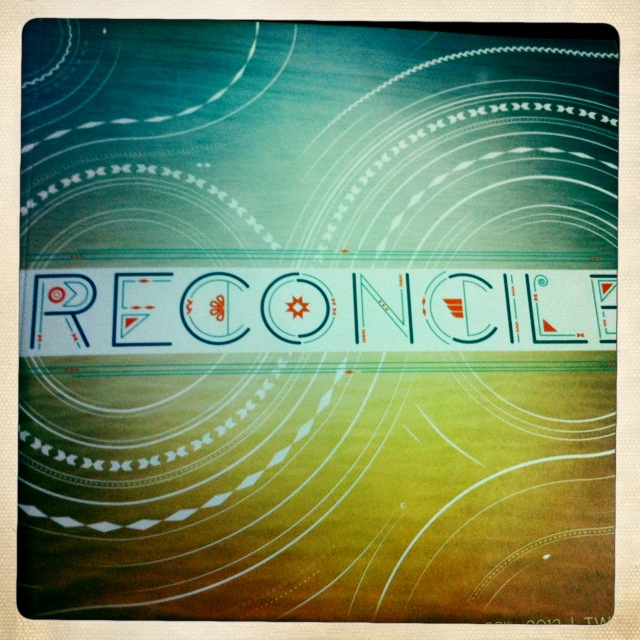 Sometimes, reconciliation needs to make way for lament, before rejoicing appears. Maybe reconciliation and any kind of justice seeking starts with an apology and a prayer. Father forgive me. Forgive us. P.S. CCDA 2013…Don’t miss it: New Orleans. September 11-14.